two years ago i broke up with deb the week after pride, so i guess this isn't my first pride with a girlfriend, but it is the first pride i went to with someone i'm planning on spending the rest of my life with. last year i was in NY with my mom for old songs. her buddy bob invited me back, but i decided to do pride this year. lisa and i went to south shore for the dyke march the day before, but i forgot to SP. there are cuter ones of us than this one, but this one has the best signs in it. 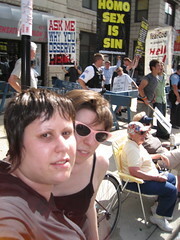 we were right by the haters, but as you can see they were surrounded by police and rainbow flags and other organizations, so i didn't feel like it was directed at me personally, just me generally. but it was a great place to watch, and see what each float's reaction to them, either the finger or making out or mooning. also, isn't this couple next to us adorable? diversey is a great place to watch the parade. sure, by the end they're all out of beads and stickers, but there were no droopy feathers or sequins, everyone's still dancing, and there are no barriers, thinner crowds, and lots of shade. yay to kristy, lynne and dalice! we'll be hanging with you again next year.